The Minister of State for Petroleum Resources, Dr. Ibe Kachikwu; and Group Managing Director, Nigerian National Petroleum Corporation, Dr. Maikanti Baru, met on Tuesday for the first since their disagreement broke out and agreed on one thing – a petroleum industry regulator free from the vagaries of politics. The two industry leaders met at a breakout session at the ongoing 23rd Nigerian Economic Summit and spoke on the controversial Petroleum Industry Bill. Kachikwu said it was also important for the industry to have a minister who would not be very powerful as it was certain that no one would be a minister forever, adding that it was important that systems were built to drive the industry. The minister moderated the panel discussion on energy at the breakout session of the summit alongside the NNPC GMD. Baru, who had spoken on the need for a strong independent regulator without any political interference, had an ally in Kachikwu, who agreed that an industry regulator should be insulated from politics. The minister stated that the government was working to ensure an improved bill that would eventually be passed and meet the aspirations of stakeholders. He said, “We are still working to make it better. By the time the Senate and the entire National Assembly finishes what they are doing, we are going to see a much stronger and a much larger independent regulator. “Whatever model of the PIB that we are pushing, the point that Dr. Baru made is very, very key to see an independent regulator with very enormous powers, with less of political interference so that individuals can do their work and also whittling down the powers of the minister so that these institutions can work and work well. He added, “The Federal Government will develop policies that ensure that the global decline in fossil energy does not take Nigeria unawares. The government is already thinking in that direction. The Federal Government is currently dealing with the fundamentals of ensuring that the refineries work, and ensuring availability of energy sources to meet our day to day energy needs. 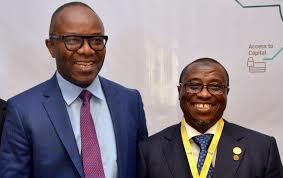 Responding to the issues raised on marginal fields, Kachikwu said that the government was determined to ensure transparency in the bidding process. “These are some of the issues that the Niger Delta communities are always inquiring about; and indeed all Nigerians. The more transparent it is, the better for us. We are developing models to ensure better regulations geared towards transparency in the bidding process, and we will alert Mr. President as soon as we are done,” he added. Baru had in his remarks on the marginal fields said that only nine out 14 of those who won the last bidding process were operating the fields, adding that the development was not good.